It seems like everyone is planning a trip to (attempt to) see the northern lights this winter. They hope it will be dark and clear enough to see the colorful streaks dance across the night sky. It sounds breathtaking—in both beauty and temperature. So, while you wish them luck, you’re going to plan your next Scandinavian trip for later in the year. Winter isn’t the time to go to Bornholm anyway. The Sunshine Island, a Danish island in the Baltic Sea, is more of a summer or early fall destination. It almost has a Mediterranean feel. That’s right, Denmark has an island with warm weather, a dramatic coastline, gorgeous beaches, and water sports. It’s known for its Nordic round churches, medieval fortress, and wooden houses. You’ll also find Danish classics, including smoked herring and snaps. A boutique hotel only makes it more appealing. Bornholm was fought over for centuries due to its position in the Baltic Sea. It lies south of Sweden, northeast of Germany, and north of Western Poland. It’s closer to all three of these countries than it is to Denmark. But—aside from short periods when the Lübecks, the Swedes, or the Germans invaded—the island has remained Danish. Dramatic rock formations and the ruins of Hammershus, which was once the largest medieval fortress in Northern Europe, sit on the north coast. One of Denmark’s largest forests and farmland fill the middle. While sandy beaches line the south coast. No wonder the Scandinavians, the Germans, and the Poles want to keep this island a secret. You’ll have plenty of time to explore the churches and the fortress, the lighthouses and the windmills, the pine forest and the beaches. But first, your home base. Hotel Nordlandet is in Allinge on the northern tip of the island. The pretty small town is home to that fortress, a popular smokehouse, and a summer jazz festival. The hotel, just outside of town, was recently renovated. It has 24 minimal rooms. They feature exposed lightbulbs and pipes, as well as L:A Bruket products. Terrace rooms include a semi-private terrace and a view of the sea. While the natural “pool” is where sea water flows into a shallow area surrounded by rocks. It definitely has a hygge vibe, something you always look for in Scandinavia, regardless of the season. Part of that cozy feel also comes from the food and the drinks. Underbar serves snacks and 10 local beers. You’ll be ready for a Bornholmer Bryg, canned or pickled anchovies, a nice chunk of Gruyère, and ham from Hallegaard when you arrive in the afternoon. 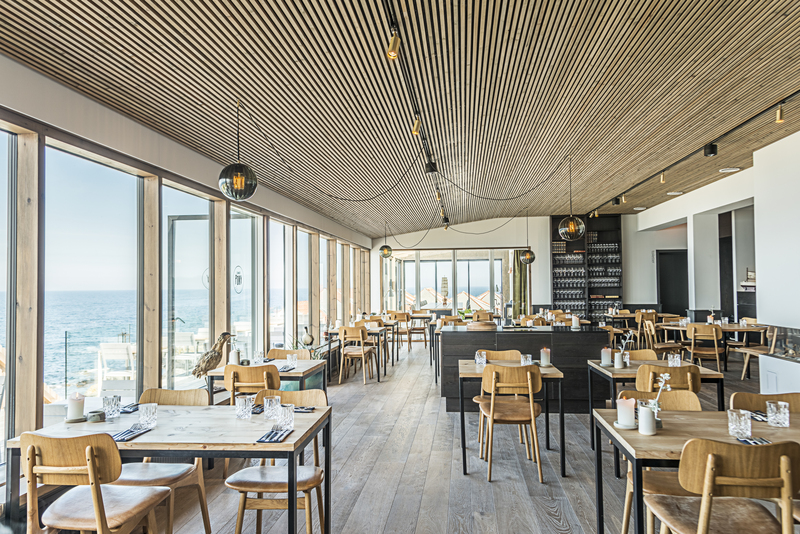 They’ll hold you over until dinner is served at Nordlandet Restaurant. The restaurant has a wooden floor, light and dark wood furniture, and huge windows. The dishes, which feature mostly local ingredients, look like pieces of art. Salted pike-perch with potato, green peach, and fermented asparagus or langoustine with pumpkin, red grapefruit, and almonds might be among the starters. Baked cod is usually an entrée. This time it’s served with small shallots and soubise sauce. Whey caramel, elderflower, and browned butter dress up a pear for dessert. While waves pound the rocks, which look purple in the setting sun, right outside. 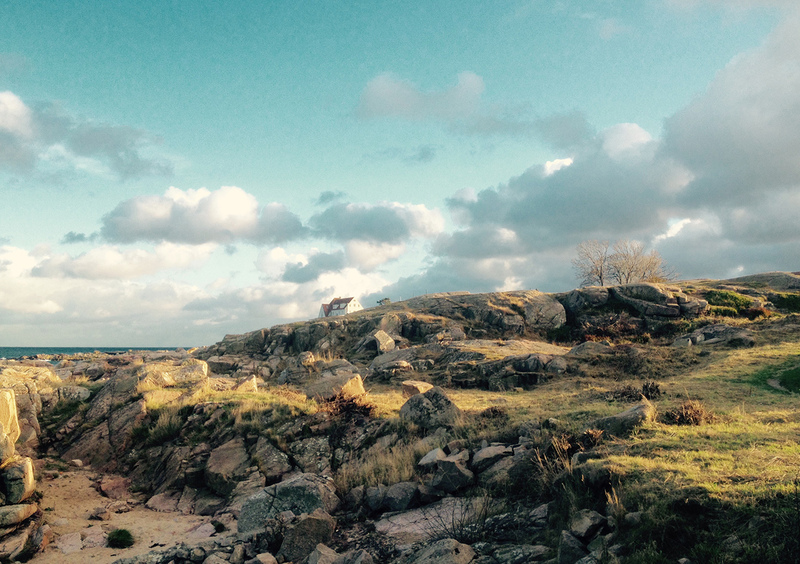 You’re falling in love with Bornholm long before you ever step foot on the island.